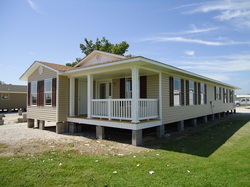 Sheppard Heritage Homes, Inc. - Sheppard Heritage Homes, Inc.
Roll-aways start out at $50.00/ sq. ft and are built with quality materials to be moved in one piece. The homes are completely finished on the inside and out with up-to-date specs. Customers who live outside our building radius can have a custom home built to be moved to their location. Whether it is one of our plans or yours; working with you to ensure that your dream home becomes a reality is what is important. Be sure to check out our Roll-Away Showcase!